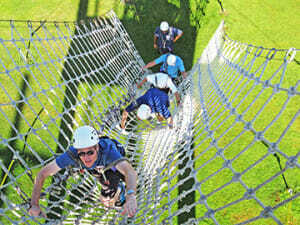 Put your team at ease with team building and corporate training in Baton Rouge, ranked 5th most friendly US city. The Red Stick buzzes with the state capital’s politics, the youthful energy of LSU and Southern University, Cajun Country cuisine, music and dance in a beautiful setting on a bluff overlooking the Mississippi River delta. Our Baton Rouge ropes courses are as diverse as our corporate teams – you may catch a glimpse of the Mississippi River from the top of a 90 ft. tandem hydraulic zip line or enjoy the shade of live oaks and the scent of magnolia trees as you climb a giant swinging ladder. The challenges in each course empower participants to expand their comfort zones—sometimes dramatically—and identify fears that may block personal achievement. A blend of Low and High Ropes activities enables participants to grow as a team and as individuals as they explore risk-taking, leadership, communication, problem-solving, and coaching. The Low Ropes Courses focus on team collaboration; the challenges, such as a team transportation challenge in A-Frame, call on every member of the team to generate ideas and provide support. Focus on risk-taking, coaching and trust during the High Ropes Courses as you attempt solo or paired challenges with encouragement from your on-looking team. Personally transformative and deeply bonding, ropes course memories and moments carry over to the work environment for a long time. The Hilton Baton Rouge Capitol Center, overlooking the Mississippi River Bridge, provides a perfect venue for our Build a Bridge program. In this team building activity, groups learn how effective communication relates to their daily lives while designing, planning, building, and troubleshooting construction of two halves of a bridge that must fit together. Blend this multi-faceted challenge with our Leader’s Role in Stages of Team Development workshop, and help leaders set and reach goals, gain support, resolve conflicts, motivate team members and achieve lasting success.